While most of the city was shooting off fireworks in celebration of the 4th, a man was shot across the street from the Mattapan B-3 District police station at the corner of Morton Street and Blue Hill Avenue at approximately 8:30 pm. According to Stanley Stacos and Universal Hub, the victim was “taken away in bad enough shape to have the homicide unit brought in.” and AlertNewEngland reports police are looking for five black men wearing backpacks who jumped on a T bus. 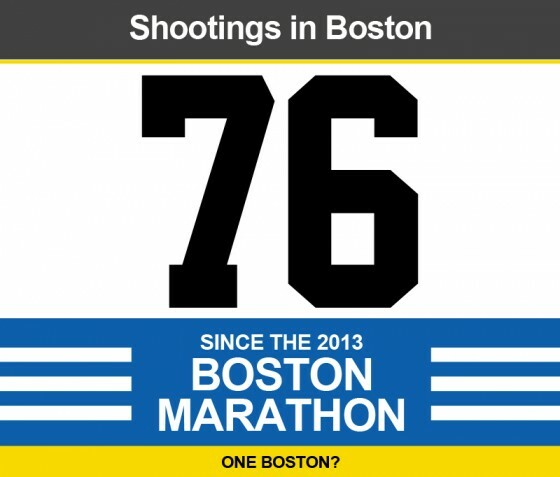 This brings the total number of shootings in Boston to 76 since the 2013 Boston Marathon. View our Live Map / List of Shootings since Boston Marathon. Behind Stashes on Blue Hill Ave., Dorchester possibly on Michigan Ave.
24 Leroy St. Dorchester – 1 Man suffered a non-life threatening gun shot wound to the torso outside near address. No suspect was apprehended in the incident. 1420 Dorchester Ave, Dorchester, MA – 1 Male suffered a gun shot wound to the leg and torso outside near Tedeschi. No suspected was apprehended in the incident. 333 MLK Blvd. Roxbury Mall – inside the Save-A-Lot Grocery Store. Suspect apprehended later on Catawba St.
View the most up to date info on our Live Map / List of Shootings since Boston Marathon.